Every morning, it is a ritual that I check all of my email accounts - work, personal and blog email. Naturally, I quickly delete those asking me to invest in a timeshare or to enlarge my privates. Then I look through all the media releases for new restaurants and of course, restaurant invites. 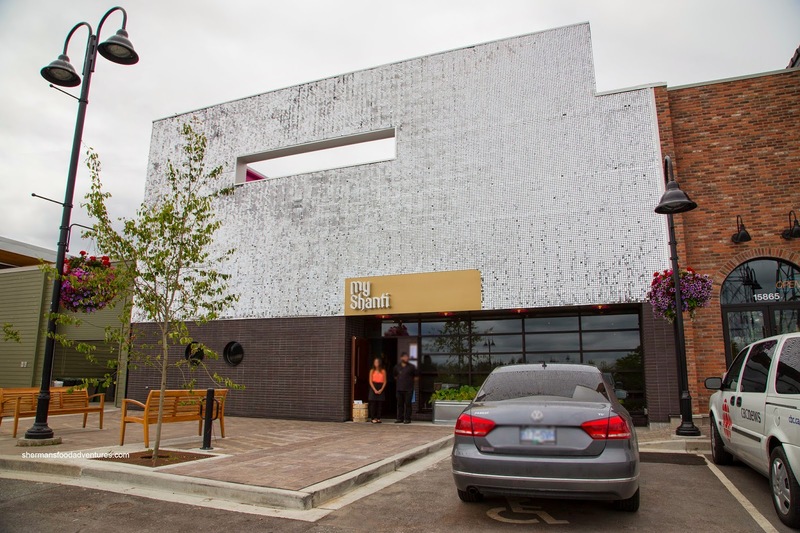 One particular email caught my immediate attention - it was an invite to tour Vij's production facility and to a lunch at My Shanti, his new restaurant in South Surrey. I don't ever remember Vikram Vij doing any of these events before. So of course, I jumped at the chance, consequently, enjoying my meal with fellow attendees Sean and BCFoodieBlogger. Before we even entered the restaurant, there was no mistaking the building as it was sparkling silver with a glare that needed sunglasses. Inside, the purple-reddish interior was ornate, yet wreaked havoc with our pictures (I did the best that I could to remove the purple tinge). 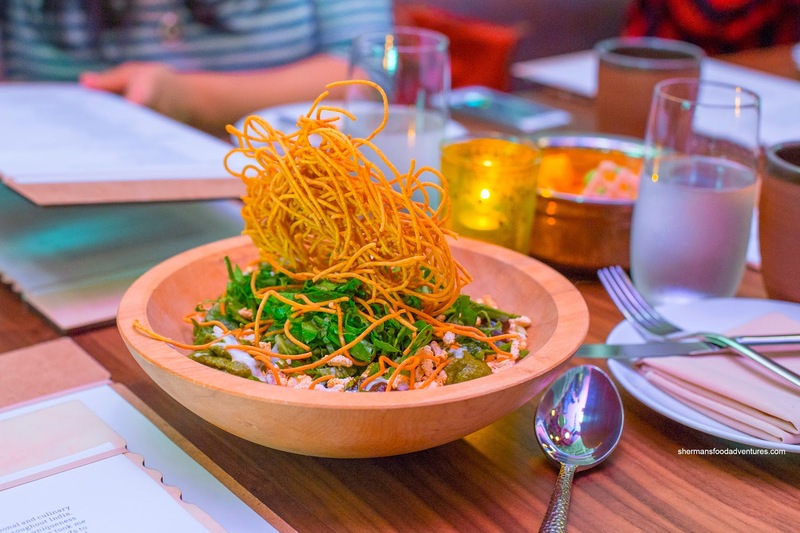 Anyways, we were started off with the Udiapuri chaat with eggplant, spinach and sweet potato. This dish was an exploration in textures with starchy, leafy and crunchy. There was a good lingering heat that complimented the apparent spices. 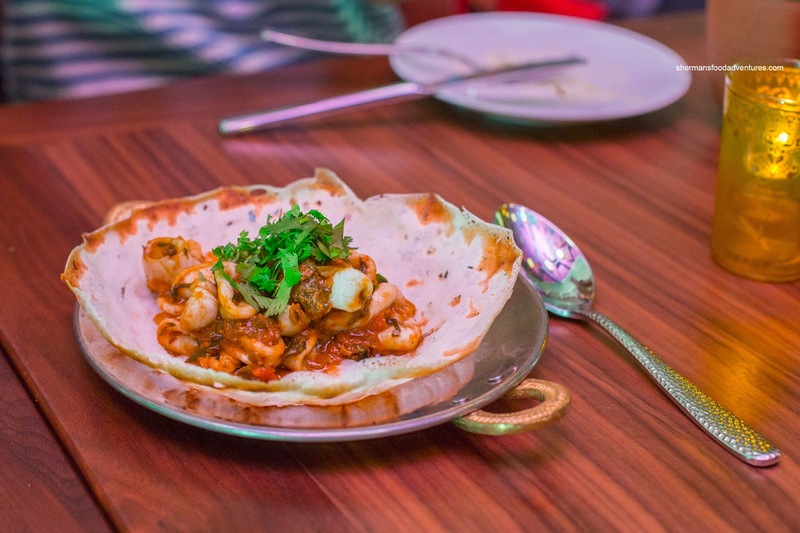 Next up, we had Bombay’s Chattpatti Squid served atop appam. Buttery soft and tender, the squid still maintained a meatiness and chew. The masala was spicy in layers, ultimately finishing off with a lingering punch. 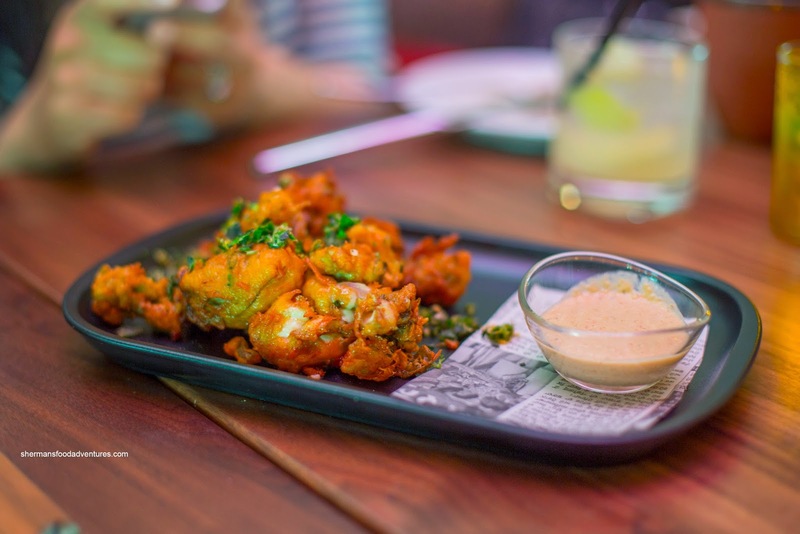 Onto another round of appies, we tried the Goan Oyster Pakoras with with spicy green chili crème fraîche. One bite and there was no doubting the taste of the sea without being fishy. The oysters were buttery and coated with a light crispy batter. I found it to be quite greasy though. 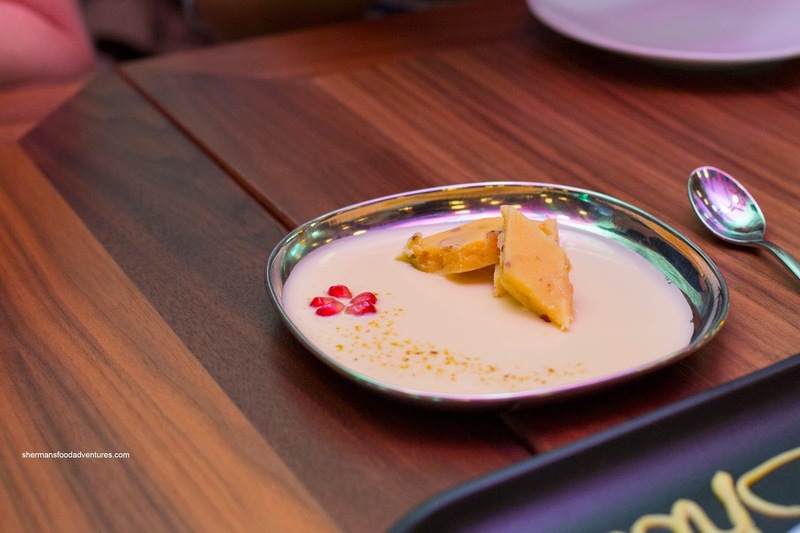 The chili crème fraîche was creamy with a slight tang as well as spice. Next, we were served Chhatra Sagar’s Baby Eggplants with mango powder & chillies. 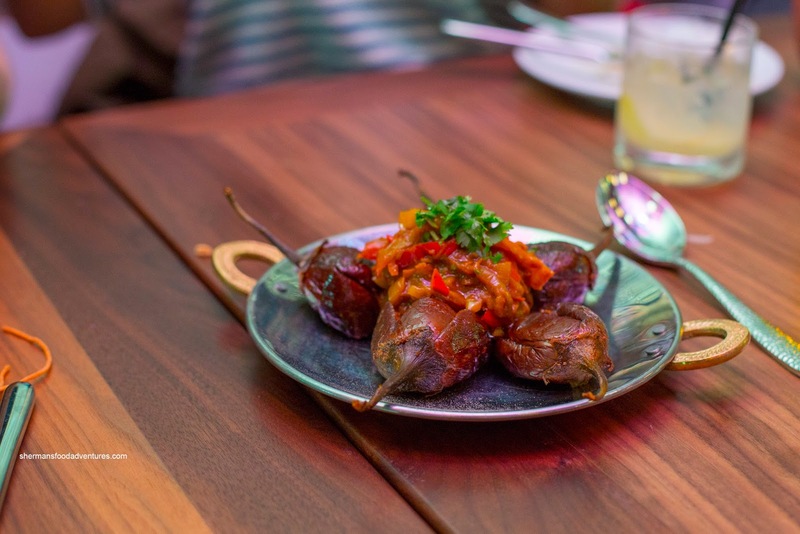 These cute little eggplants were tender while staying intact. Again, there was a noticeable spice level accented by a tart zestiness. Although not in the description, there was the taste of tamarind. 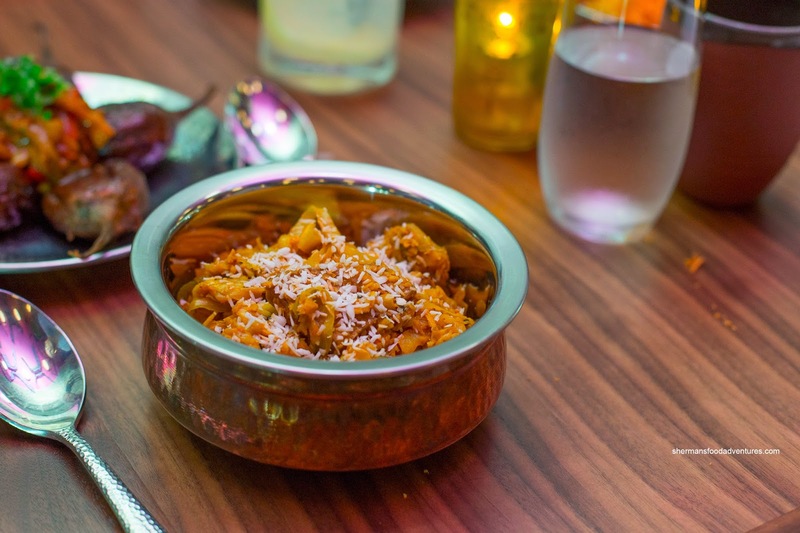 With one last "appie", we had the Mysorian Vegetable Thoran topped with grated roasted coconut. Consisting of jackfruit and shredded veggies, the soft mixture was sweet and spicy. The toasted spices added aromatics as well as the crunchy coconut topping. 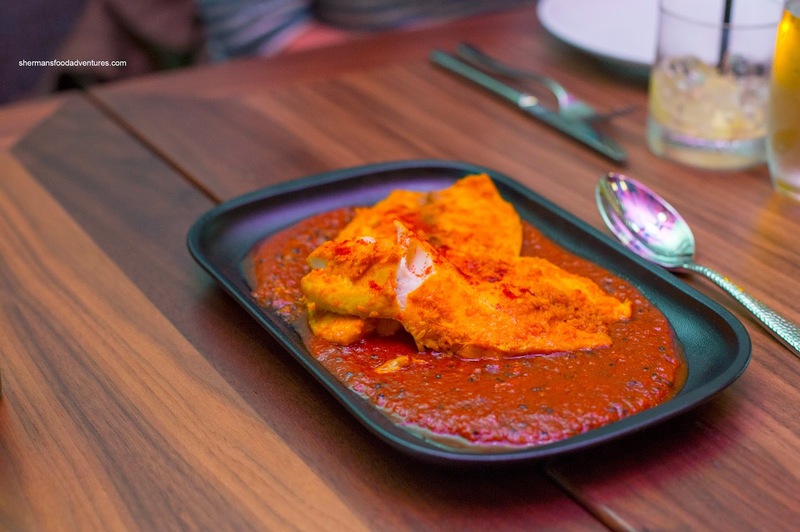 Moving onto the mains, we were presented with Calcutta’s Panch Phoran Steamed Fish atop a "very mustard gravy". Although tilapia can often be mushy and devoid of texture, the one here was flaky and moist. Underneath, the sauce had a noticeable tang and once again, a purposeful amount of spice which added flavour without overwhelming the fish. 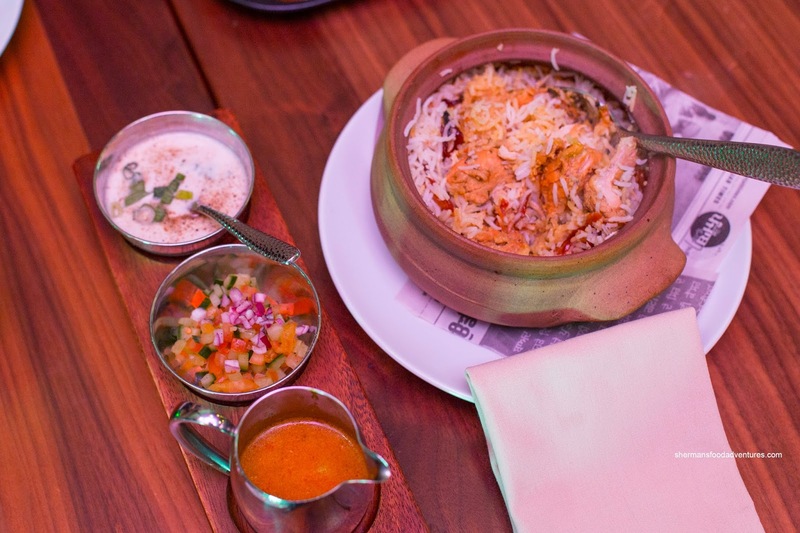 Moving on, we tried the Hydrabadi Chicken Biryani served with 3 mistresses. No, don't be alarmed, we weren't up to some debauchery, rather they were sides of cashew gravy, kachum­ber and raita. The rice itself was fluffy with a crust on the sides of the clay pot. There was a slight cinnamon aroma that was addictively fragrant. I particularly liked the cashew gravy as it was sweet and nutty. 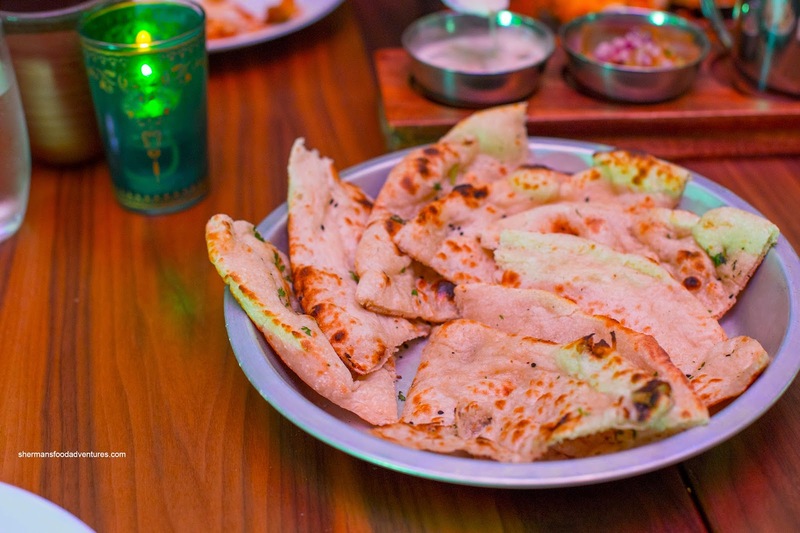 As part of the kitchen tour, we were served fresh Naan from the tandoor. Fluffy and light on one hand and chewy and slightly crisp on the other, these were very good (and much better than the ones I've had a Vij's in the past). 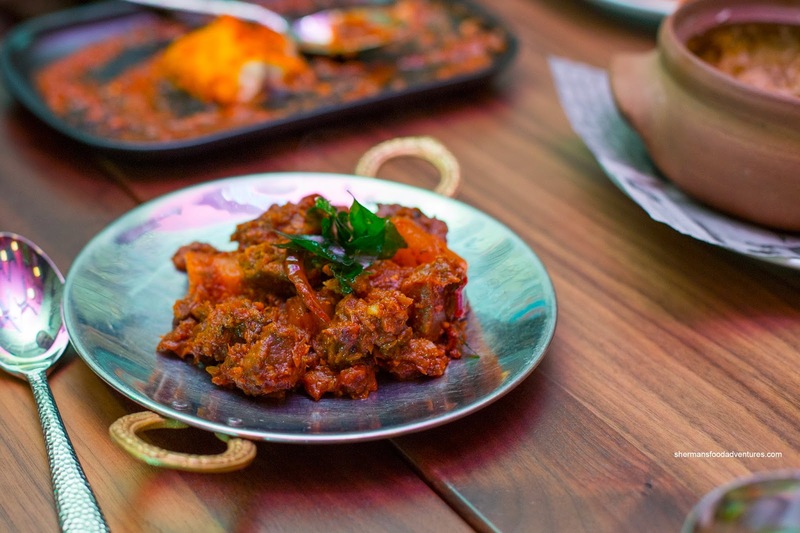 Our last savoury dish was Banglore’s Goat Curry with cassava. After my initial taste, the spiciness was quite apparent. Again, it wasn't "burn-my-tongue-off" hot, rather, it merely added another layer of flavour where the other spices such as coriander and cumin came through. The goat itself was tender while the cassava added a starchy texture. We ended off the meal with 2 desserts consisting of the Almond & Pistachio Fudge atop coconut cream and Almond Macarons. The soft and slightly grainy fudge was not as sweet as it looked. The real star of the plate was the aromatic coconut cream. As for the macarons (made of cashews, rather than almond), they were rather chalky and not really my cup of tea. 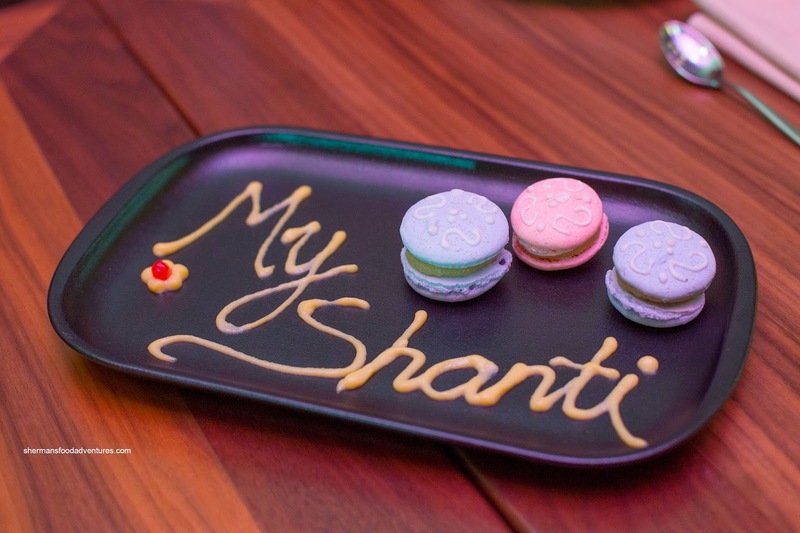 Despite this, I thoroughly enjoyed the tasting at My Shanti. Kudos to Vikram Vij, for boldly bringing his food to South Surrey.